I’ve not especially been subtle in the past about how much I really like Natalie Dormer, and not just because she is an exceptionally beautiful woman who my natural heterosexual male instincts are instantly attracted to. I have always found her to be an exceptional actress, whether in shows like Game of Thrones and The Tudors, or in in films like W.E. and both parts of The Hunger Games: Mockingjay, where she always exhibits a natural charisma and screen presence that always made her an extremely likeable performer to watch. Since first seeing her, I had wanted to see her carry a movie in a lead role, and though I eventually got my wish with horror movie The Forest – except that wish was made on a monkey’s paw, because that movie sucked (although she certainly didn’t) – she’s now doing it again in a movie that’s not only a lot better than The Forest, but also marks Dormer’s writing debut alongside director and her real-life partner Anthony Byrne. Needless to say, Dormer once again shines as she always has, and luckily the film itself is an entertaining and suspenseful ride that (mostly) sticks the landing. In Darkness is about Sofia (Dormer), a blind woman who lives a quiet existence in her London flat, making a living as a pianist. One night, she hears a commotion in the flat above her, which ends with her neighbour Veronique (Emily Ratajkowski) plummeting to her death into the street. The crime brings Sofia unwanted attention from not just the police, specifically from the determined Detective Mills (Neil Maskell), but also criminal siblings Alex (Joely Richardson) and Marc (Ed Skrein), who are seeking a USB drive that Veronique had compiled to expose her businessman father Milos Radic (Jan Bijvoet) as a Serbian war criminal. It is this latter figure that Sofia is constantly drawn to, leading to a reveal about her past that suggests that she has always had a vengeful motive this entire time. Who she is, and what her overall mission is, is just one of many plot twists that the movie throws into the mix, some of them intriguing and others just on the verge of being a little too far-fetched. I’m not even going to mention the final rug-pull during its concluding moments, which I can see either making or breaking the movie for a lot of people. However, while it flirts constantly with going a bit too far over the top, it’s always kept on a retractable leash by Byrne’s steady direction and a fun script that both Byrne and Dormer put their heart and soul into making as comprehensible as possible, no matter how silly it can get. You can tell that they watched a lot of suspense thrillers in preparation for this, specifically Hitchcock classics like Rear Window, because it gives off that very Hitchcockian vibe in its premise alone, and continues to do so at least until the first half of this movie is wrapped up. The film wears its influences on its sleeve, and if the film did indeed stick to that tone well into its second half, when things start to get a bit more contrived and generic, this could have definitely been a worthy homage to those kinds of movies. As is, it’s a perfectly serviceable thriller with a number of silly moments, but they aren’t enough to entirely derail the film in my opinion. It kind of goes without saying that Natalie Dormer is truly great in this movie; in a role that she co-wrote, she absolutely nails her character’s seemingly naïve nature and displays a darker side that you’re curious to learn more about, because she really does command every scene she’s in just by her naturally likeable presence. She is utterly fearless here, doing things on-screen that other actresses would easily bail on, but Dormer isn’t afraid to go all in and use her physicality to gain the upper hands in more ways than one, and the fact that she’s doing some of these things while also without the ability to see just makes the scene all the more tense and thrilling. It’s also needless to say that this is a far better use of Natalie Dormer in a lead role than The Forest, but you kind of knew that anyway. Ed Skrein, too, is one of those actors who I wasn’t initially sold on (his lead role in the Statham-less Transporter Refuelled was so charmless and wooden, it would have been a career-ender if he weren’t so persistent), but the more I see him in stuff, the more I’m kind of warming to him, and here he’s got a surprisingly strong arc with revelations about his character and his relationship to Ratajkowski’s human MacGuffin that make him far from just the stock henchman type you normally see in films like this. If Natalie Dormer is the all-seeing presence (and no, the irony is not lost on me when making that statement), then Skrein is the muscle, and he gets some decent action scenes in this that make you wonder why in hell was this side of the actor not present in that Transporter movie, because here he is much more of a human being than the monotonous robot I remember him being in that film. Dormer is the true MVP of this film, though, both in front of and behind the camera, and has a good enough director in Anthony Byrne to guide her through what is clearly a labour of love for the both of them. Apparently, it took almost a decade to get this film made, and only came to fruition thanks to Dormer’s rising status on shows like Game of Thrones, so their persistence in getting this film made, even though it didn’t turn out entirely great (there are some moments that do seem way too ridiculous), is inspirational to say the least, and just goes to show that as long as you truly harbour passion for something, eventually others will pick up on it and make it a reality. Such is the power of Natalie Dormer. 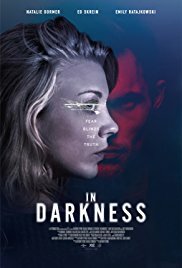 In Darkness is a perfectly watchable suspense thriller that’s entertaining and suspenseful enough to keep your attention, and features a great lead performance by co-writer Natalie Dormer, though there are twists and surprises that get a bit too ridiculous for its own good at times.